Octavian's not everyone's cup of tea. We know that right? This is not a book with mass teen, or general reader appeal. This is a book for your readers. Your nerdier types. You know who they are. Sometimes, I think we get too hung up on "appeal." We're always asking who the audience is and if they will like it. We deal in buzz and word of mouth and everyone's trying to be the next Harry Potter or Twilight. We don't have room for the odd book like Octavian. We wonder if, when books like this get awards, if the awards have lost touch with "what kids are reading today" even if the award is about quality and not appeal. In our desire to get everyone reading and everyone into libraries we forget the nerds. The ones who've always sought refuge in our stacks. And I always wonder, in our quests to make everything appeal to everyone, if we're pushing away our core audience--the misfit geek crew. Or, in my snarkier days, I'm wondering if we're just trying to make libraries cool so that the fact we spent every lunch period in our youth in the library will now be cool, and not nerdy, because we obviously still have some unresolved issues from our childhoods. Anyway, Octavian is for the type who comes to the library even if it's not cool. Octavian is for, well, ME. You should read the first one first. If you liked it, you should read the second. 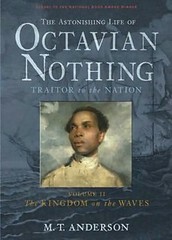 This one finds Octavian and Dr. Trefusis in British-occupied Boston, and then escaping to British-occupied Virginia, where the governor has promised escaped slaves their freedom if they fight for the Crown. Octavian is taught harsh truths about the freedom is not equality, and no longer being a slave doesn't mean respect, or that people will value your life as much as they value their own. We see war, gritty horrifying war. We watch Norfolk burn. We hurry up and wait, hurry up and wait, hurry up and wait. And I cried as I came to see the type of man Dr. Trefusis really was and lost all respect for him. This book will be less shocking to readers than the first. While Anderson writes powerful and moving accounts of plantation slavery and war, readers are familiar with these themes, unlike the shock of the twisted ways of the College of Lucidity. But, if you liked the first, pick this one up and slip it to your bookworms. I loved these two books as well. I guess, okay, I know, I'm the nerdy type! I really liked both Octavians, after I got used to the challenging vocab/syntax. They stretched me in more ways than one. I was really glad to see this different perspective on the Revolution than what I had been given as a teen. This past week I read Laurie Halse Anderson's Chains, another great book set in the same time & place with an African American character's point of view. You should read that one too. I see you have her Fever book on your list of books read but not reviewed. I read that one a couple years ago and would love to see what you thought of it.